The Medici Brothers Circus is struggling to bring in a crowd and make a profit. World War I vet Holt Farrier (Farrell) returns home to join his kids under the big top but learns his act is in limbo as his prized horses have been sold off. 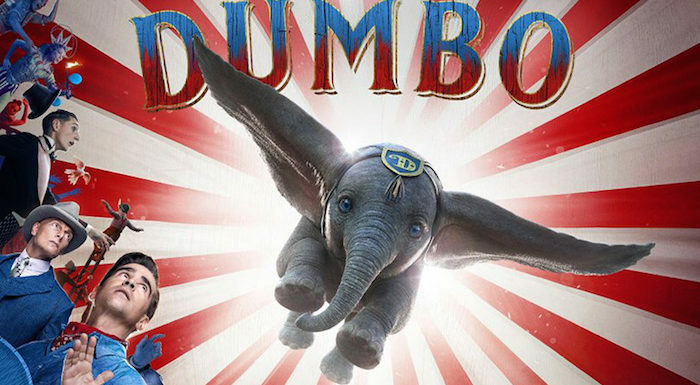 A new baby elephant with unusually large ears is at first mocked and teased by ringmaster Max Medici (DeVito) but turns to Holt and Holt’s two kids to train him. Holt’s daughter loves science experiments and learns by accident that this baby elephant can fly thanks to his floppy ears and the use of a feather. The kids train him to be the star of the show. There are a few hiccups at first, hence his nickname Dumbo, yet his gift of flight along with his adorable presence bring in audiences from far and near. He catches the eye of V.A. Vandervere (Keaton), a cunning business man who sees great potential for Dumbo. Max sells his circus but puts too much trust in Vandervere’s slick operations. He’s a man who cannot be trusted and has alternative motives for wanting to showcase Dumbo.